Saturday May 8th 1897 I got the work done early and went to town alone. I did a great many errands and did not get over home till dinner was ready. I spent the afternoon with Mother and got home by six oclock. Did evening work. Sunday May 9th 1897 I went down to Sunday School and church with Charlie Mc--- I got the dinner over and read a little in the afternoon. I was tired and went to bed early. This is Hattie's birthday. She is forty years old. 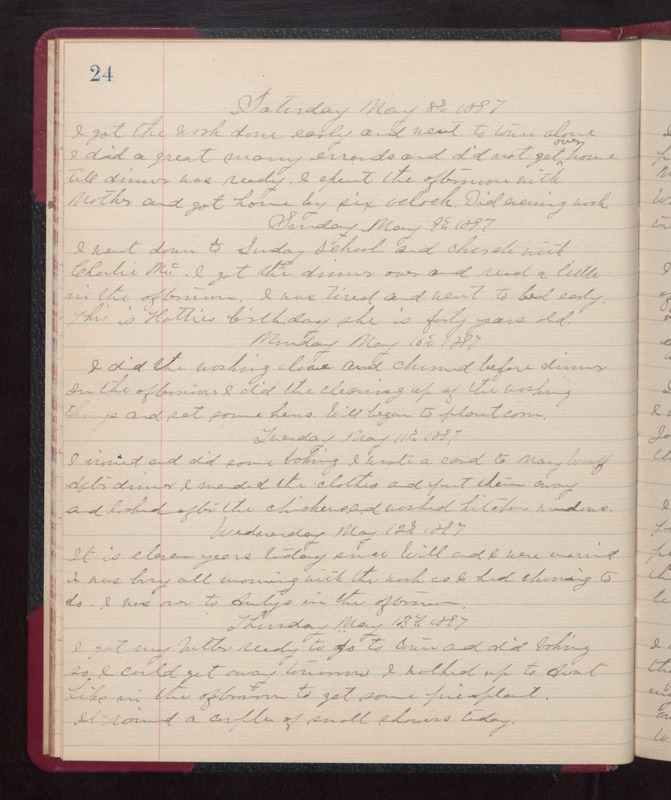 Monday May 10th 1897 I did the washing alone and churned before dinner. In the afternoon I did the cleaning up of the washing things and set some hens. Will began to plant corn. Tuesday May 11th 1897 I ironed and did some baking. I wrote a card to Mary Woolf. After dinner I mended the clothes and put them away and looked after the chickens and washed kitchen windows. Wednesday May 12th 1897 It is eleven years today since Will and I were married. I was busy all morning with the work as I had churning to do. I was over to Auntys in the afternoon. Thursday May 13th 1897 I got my butter ready to go to town and did baking so I could get away tomorrow. I walked up to Aunt Libs in the afternoon to get some [pie?] plant It rained a couple of small showers today.